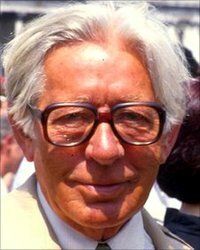 Laurence Edward Alan "Laurie" Lee, MBE, was an English poet, novelist, and screenwriter. His most famous work was an autobiographical trilogy which consisted of Cider with Rosie (1959), As I Walked Out One Midsummer Morning (1969) and A Moment of War (1991). While the first volume famously recounts his childhood in the idyllic Slad Valley, the second deals with his leaving home for London and his first visit to Spain in 1934, and the third with his return in December 1937 to join the Republican International Brigade.